Considering the amount of time and care that homeowners everywhere put into the decor of their houses, it doesn't surprise me that those style-conscious feelings extend to home safety products as well. After all, when you select a baby gate to put at the bottom of the stairs, you put it there to keep your little one safe... but you also want it to match with your home furnishings as much as possible, right? As part of a survey for a consumer education program tied to national Fire Prevention Week, First Alert (a leader in residential fire and carbon monoxide detection devices) has found that more than half of Americans would be more likely to buy new smoke alarms that offer the latest in technology in a smaller, more attractive design. Add to that the nearly 40% that would like to have a choice of buying alarms that better blend with their home decor, and it only makes sense that First Alert recently introduced two new series of alarms that offer both visual appeal and the latest in technology: the new Atom and Maximum Protection Alarms. Vast departures from their bulkier counterparts, First Alert's new smaller alarms are a fraction of the size of traditional alarms and feature breakthrough technology to help reduce the occurrence of nuisance alarms. Gone are the days of choosing between the bland, boring, clunky, dull, plain and unattractive fire alarms when these miniature version are able to easily blend high tech and high design! Deborah Hanson, director of external affairs for First Alert, said, "Today’s consumers are increasingly seeking more sophisticated, streamlined designs that complement and enhance the look and feel of their home." Despite the desire for style, however, First Alert's survey found that safety continues to be the #1 factor when choosing smoke and carbon monoxide alarms, which is why their new, modern alarms are just the right mix. Just look at the awesomeness of the new First Alert Atom alarm! Weighing less than two ounces, the Atom alarm is available in a wood grain, stainless steel, bronze or white decorative finish. But as well as looking great, this sleek, small photoelectric smoke alarm features revolutionary micro technology with an advanced smoke entry system for fewer false alarms, and a loud, penetrating siren to reach the whole home. The most important thing is to ensure your home is best prepared against the potential dangers of fire and carbon monoxide, whether you install a traditional alarm or a new, high-design unit... but if you have the choice, why not go for the more attractive of the two? To ensure the highest level of protection from smoke and CO, the National Fire Protection Association (NFPA) recommends installing smoke alarms at the top of each staircase and one in every bedroom or sleeping area. For CO alarms, homes should have at least one CO alarm on each level, including the basement, and one in or near every bedroom or sleeping area. To put this into perspective, the average-sized U.S. home – a two-story, three bedroom house – would need a minimum of four smoke alarms and five CO alarms to comply with NFPA guidelines. As well as offering a wide range of smoke and CO alarms, First Alert is also making it even easier to keep your home safe right now with their Style Your Safety Sweepstakes. 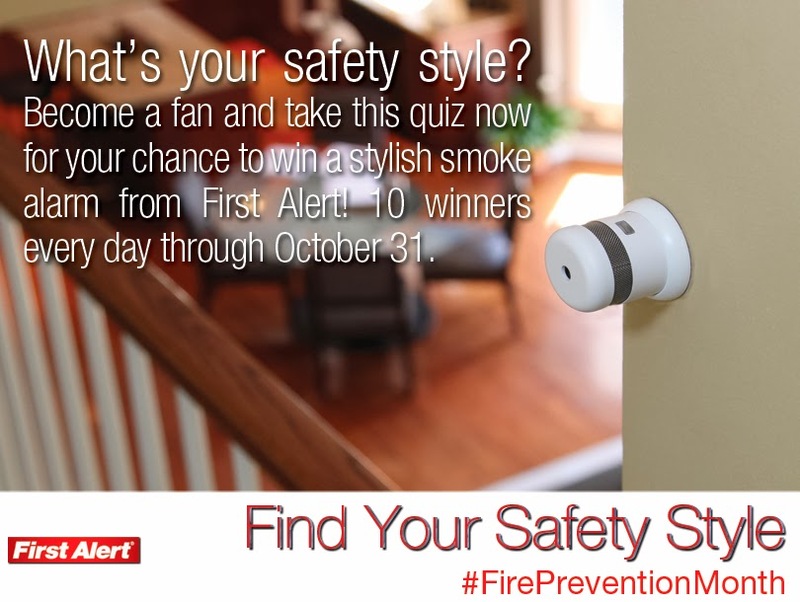 Simply head over to visit First Alert on Facebook and take their quiz to determine your safety style and then you'll be entered to win the alarm that matches your style – there are 10 winners per day! Throughout the end of Fire Prevention Month and beyond, take the time to ensure that your home and your family are as safe as possible. 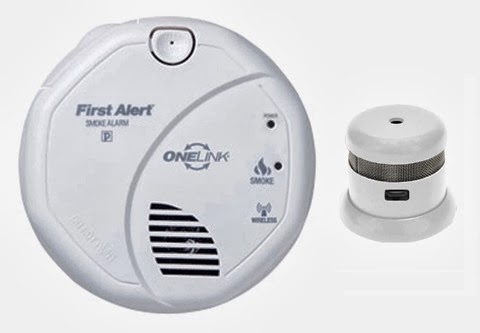 First Alert can help with anything from combination smoke and CO units to smoke alarms with escape lights to basic battery-powered products. Just find which ones are right for you and have them installed correctly with working batteries! First Alert smoke and CO alarms are available at national retailers and online. Head over to their website at FirstAlert.com for more information (and to find a convenient complete home safety checklist) and connect with them on Facebook and Twitter. One lucky person will win an Atom Photoelectric Smoke and Fire Alarm from First Alert! 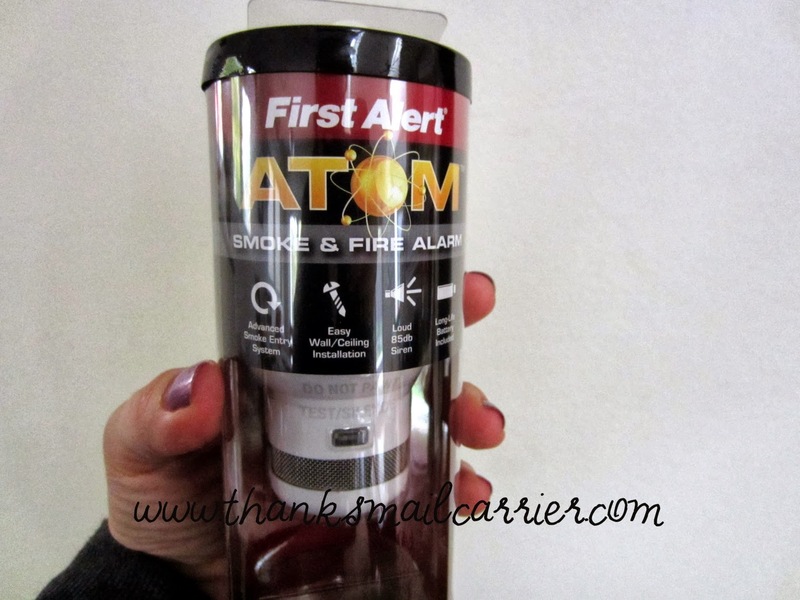 A big thank you to First Alert for providing an Atom Alarm for me as well as for one lucky giveaway winner. The opinions shared are my own and honest and if you really need to see more, click here to see how I roll. We have one alarm in our home. We have 3 smoke alarms in our home, but one needs to be replaced. We have two in our house, one upstairs and one downstairs! This would be great for the living room upstairs! We have three alarms in our house. We have 3 or 4 in our home. We have two in our home. One on the main floor and one upstairs in the hallway. We have 2 but one broke not that long ago. We have seven smoke alarms in our home. We only have one, and its actually on my Christmas list to get them for each bedroom. We have three alarms in our house. Thanks so much for the fantastic giveaway! We live in a multi level house so we have 8 smoke detectors and 1 carbon monoxide detector. All of the detectors are electrically wired with battery back up. Thanks for the great giveaway opportunity. Keep up the terrific blogging! We have 4 alarms in our home. I have two smoke alarms in my house. Thank you. I have two smoke alarms,that need replacing. We have four but I think we need more. Hmmm... maybe 6? You can never have too many. Except maybe if my mom is cooking in your house. We have seven smoke alarms. We have four or five smoke alarms in our house. Can't remember offhand if there's one in the spare bedroom. We currently have 5. We don't have a big home. And we are on one floor. Thanks! we have 2 smoke alarms in my house. We have 4. We also have a family fire drill. I have two of them in my one bedroom apartment. We have 7 in our home wired into our ADT. We need one for the nursery nook. We have 7 in our home. One upstairs and one downstairs so two. we have six smoke alarms. I have 3 in my home. We have about 5 smoke alarms in the house! I have four smoke alarms in the house. we have 9 at least! I think we have 3 smoke alarms, but they all really need to be replaced. We have one alarm in our house. We have 3 smoke alarms in our house. We have 6 in our house. We have at least 7. We only have one in our home. Not estimated, but certain. I have just one. I just moved in to a new place last year with new building codes and we have unbelievable six smoke alarms. We shouldn't sleep thru those! We have 3 in the house. I have 2 - 1 is upstairs and the other is downstairs. We have four in our home. We have 5 in our house. We have 10 smoke detectors. We have 4 of them. I believe we have 3. We have three smoke/carbon monoxide detectors in our home. We only have two :0 I have five more to install still. We have six smoke detectors. We have 2, 1 at the master bedroom door and the other in front of the other 2 bedrooms that are side by side. I just moved and the home is large but has only 1 that works. We have 2 and we need more. We have 2 smoke alarms--one upstairs and one downstairs. Thanks for the giveaway… we have two smoke alarms at our place. I believe we have 4 smoke alarms. I should probably know that for sure though! We have a total of five smoke alarms in our home. We have 5 - one in each bedroom, one in the hallway and one in the basement. We have 3 or 4 in our house! We have a four level house, so we have an alarm on every level. AND a carbon monoxide alarm in the basement too. We have 2 smoke alarms in our home. we only have one in the girls room! I have only 1 plus a fire extinguisher. I live in an RV so I don't need too many. I have one smoke alarm in my home that is hooked up and one that is not. We only have 1 right now. we have two smoke detectors in our house right now. We have 3 in our small apartment. I have one smoke alarm.